According to a recent report generated by PWC, the next four years are going to see digital ads taking charge of the way for global media growth. Catching TV in the process, it is expected to account for 33% of total advertising revenue. The report also emphasized that the growth however will not just need the application of digital technology but the adoption of a digital mindset by the businesses to build the right behaviors, making progress from a digital strategy to a business strategy fit for a digital age. Moreover, as per the report TV advertising is most likely to generate $173.7 billion worldwide in 2014 and grow to $214.7 billion in 2018. However, internet advertising is expected to grow from $133 billion to $194.5 billion in the same duration of time. 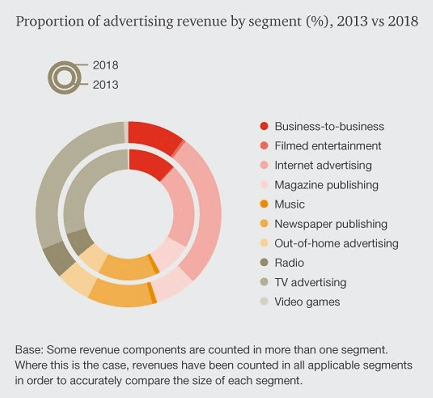 If look back and take a look, revenue from TV advertising was more than twice that from Web ads as recently as 2010 but the way digital advertising is booming , it will pass the former as early as 2020 that will of course mark a major shift. As far as the compound annual growth rate (CAGR) is concerned, it is 5.5% for TV while 10.7% for the internet. So, things are as obvious as they could be. According to Marcel Fenez, PwC’s Global leader, entertainment and media, the substratum of a strategy meant for the digital age is the digital mindset and that is about getting ever closer to the customer irrespective of the organization and in everything it does. “We now see that mindset embedded in many entertainment and media companies. But the industry needs to get even closer to the consumer and adopt more flexible business models. To do this, companies must exhibit three behaviors: forging trust with consumers; creating the confidence to move with speed and agility; and empowering innovation. This will be an important step in monetizing the digital consumer,” he advises.